ATTENTION, MEATBAGS! 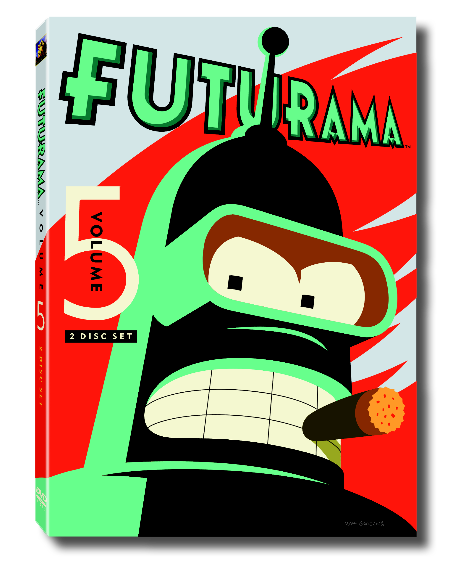 Futurama Volume 5 -- that is, Season 6, or, if you will, possibly in a parallel universe, Season 7-- but really, Volume 5, at least in the United States -- but it will be differently numbered in other territories probably for sure, just to confuse us, is coming out on DVD and Blu-ray on December 21, 2010, just in time for the Xmas, Hanukah, & Kwanzaa gift-giving season, conveniently! The 2-disc set will include all 12 of the episodes that aired this past summer on Comedy Central, plus The Futurama Holiday Spectacular, for a grand total of 13 brand-spankin' all-new episodes. Finally, we can all relax, unlace our corsets, inhale a big breath of carbon-enriched air, and thank Zombie Jesus that it all came to pass. Thank you, Loyal Fans, for your rabid and unwavering support!!! • "Bend it Like Bender"--Bender's first, best, and only music video!